I recently had the pleasure of interviewing Larry Shiller of Shiller Math about the Montessori home school method. Here's the full transcript of our interview, in which Larry discusses the benefits of the Montessori homeschool. Tell me a little bit about your educational background and your experience with homeschooling. From when I was 6 years old I noticed I was a little different than my "peers": I loved math! And I was surprised that few others did. Later, after getting a math degree from MIT and gaining experience in the publishing industry, I wanted to share my love of math - so that all children who could take full advantage of the homeschooling experience. Born in 1870, Maria Montessori was Italy's first female physician. Dedicating her life to children, in 1907 she opened a children's school that took in the physically and mentally handicapped, the learning disabled, the indigent, and anyone else not welcome in the public schools of the day. After only a few months many of her students started outperforming the rich kids and her methods gained great popularity. Since then tens of millions of children have benefited from her approach. What is the Montessori home school method? The Montessori philosophy calls for students to learn at their own pace, to use all of their brain power by using all the senses and their bodies to learn, and to be in an environment that respects their unique capabilities and is developmentally - and physically - appropriate. For example, in a Montessori classroom a grownup's first impression is that of a little world, with little furniture, toilets, and so on, made for little but growing children. How did you become interested in Montessori education? In developing ShillerMath, our researchers found that Montessori has a well-deserved and unparalleled reputation for bringing the best out of children. By incorporating the Montessori philosophy and methods into ShillerMath we are able to make math fun and rewarding for both student and parent. How does the Montessori home school method differ from other methods of instruction? The ShillerMath implementation also includes prescriptive answer guides that help parents prepare customized lesson plans for each child. Such a personalized learning approach is typically not available in a "one size fits all" curriculum that is so common today. What are the benefits of Montessori home school methods over other methods of instruction? Are there any disadvantages to Montessori home school methods? The ShillerMath/Montessori approach is very different from most other homeschool math curricula. Parents who want a drill and kill, memorize and recite, prepare-for-the-test type of curriculum may not like ShillerMath (although their children will!). ShillerMath is designed to help children become independent learners as soon as they are ready. Parents who want to dictate their child's learning pace - as opposed to letting their child set his or her own learning pace - will have trouble letting go and may not leverage the full power of the program. What is the role of hands-on activities in a Montessori home school program? To be most effective, learning activities should use every part of the brain. Visual activities stimulate one part of the brain; tactile activities that use the nerve endings in the skin stimulate another; kinesthetic activities that use the nerves within large muscle group stimulate another; and auditory activities stimulate yet another. Most math curricula use only 30% of the brain because they don't include significant auditory and kinesthetic components. Try to erect a tall building on 30% of its foundation and it will soon topple over. We don't want to see that with our children's education: With ShillerMath every concept is covered from all the learning styles to insure that virtually all brain and muscle cells are used and connected. What role do tests and worksheets play in a Montessori home school program? Unlike a typical Montessori classroom, ShillerMath has both tests and scope and sequence, because we recognize that parents are not typically trained in Montessori methods or philosophy. Outcome #1 comes about when a student does a lesson and gets it right away but usually because the learning styles of the lesson and student don't match, the student has no interest in drilling or practicing the lesson. We recommend moving on; with ShillerMath the student will cover that concept from another learning style. Outcome #2 occurs when the learning styles match. Here a student gets it but really enjoys it and wants to repeat the lesson over and over. We often see this when the lesson is kinesthetic and the student enjoys the body movement. Here we recommend letting the student get closure on his or her own terms. A student might spend three days on a single lesson! That's a good thing: it develops focus and concentration and greater self-confidence. Outcome #3 occurs when the student doesn't get it, regardless of learning style. We recommend giving the student the choice to put it aside and revisit it in the next day or two. Students may opt for this, or to struggle through it. If they choose the latter, they may experience some angst but it's of the good kind because they're in charge (as opposed to a teacher telling them they have to learn it today because there's a test tomorrow). When children take the ShillerMath tests, each test question has one of these same three outcomes. The prescriptive answer guide (this specifies the lessons that correspond to each test question) is used not only when students get the wrong answer (Outcome #3) but when they get the right answer but don't have closure (Outcome #2). With this approach, students love the math and get really good at it. And they might spend as much as nine to fifteen months in testing while typically advancing as much as two grade levels during that time. Worksheets are present in both Montessori classrooms and with ShillerMath; they allow students to develop and demonstrate their competence. Why do Montessori home school programs place emphasis on multi-age instruction? Age discrimination is illegal in our society but for some reason it's OK in the classroom. Public school bureaucracies invented grade levels for the bureaucracy, not for the student. Children in a multi-age environment not only learn to mentor and be mentored, they have a more accurate view of the society we are educating them to enter. How do parents who use the Montessori home school method make sure their children remain on grade-level? Let me make a provocative statement: At ShillerMath we really don't care about grade level. We do care about each student's individual potential and providing the student - and parent - with every possible tool to maximize the degree to which a child reaches his or her own individual potential. Regardless of age, grade, or standards, you simply cannot do better than that. This is America; we celebrate the individual and that's what makes us great. We are not interested in cookie-cutter factory solutions to education: Let's bring out each individual child's unique qualities and talents by providing an appropriate environment and curriculum - and let the chips fall where they may when it comes to age, grade, or standards. What type of families/students are well-suited to Montessori home school techniques? A homeschooling family is well-suited to Montessori by the very fact that it is homeschooling. Whether a child is gifted, average, or learning disabled, the ShillerMath/Montessori approach respects who and what that child is, and provides the tools and advice to help that child advance to the greatest possible extent. What type of families/students struggle with Montessori home school methods? In our experience, when a parent wants to provide an education similar to that of the public schools, that parent may need the stiff structure and lack of choice/flexibility to feel comfortable. For example, if a parent is not comfortable with a curriculum that has variable times per lesson depending on the child, a Montessori-based instruction will probably not be advisable. How can parents introduce Montessori instruction into their homes? ShillerMath provides complete kits that you can think of as "Montessori in a box." The kits include lesson books and worksheets, answer guides, audio CDs, manipulatives, and basically everything a parent needs to implement Montessori math in the home. After a few lessons, parents - and children - on their own quickly recognize the Three Period Lesson and other Montessori techniques. What should parents look for when choosing Montessori home school products? First, find a product that has been edited by a reputable Montessori teacher training institute. For example, ShillerMath lesson books 1, 2, and 3 were edited by the Princeton Center for Teacher Education, a world-renowned AMS (American Montessori Society) teacher training and certification center; many of the world's best Montessori teachers were trained at PCTE. Next, make sure the parent doesn't need to have attended the institute! If the curriculum requires lesson preparation the parent probably needs to know more about Montessori than he or she has time for. With ShillerMath there are no thick parent guides to read or boring videos to watch: We built the Montessori knowledge into the curriculum so that children are learning math within minutes of the kit's arrival in the home. Why did you develop ShillerMath? My mission is to make the U.S. #1 in math (we're currently in the bottom 20% among industrialized nations). ShillerMath provides the tools to help us complete that mission. What type of products does ShillerMath offer? Our two main products are Kit I for 4-8 year olds and Kit II for 9-12 year olds. Each kit has a complete set of lesson books, answer guides, a parent guide, manipulatives, and 25 math songs that integrate into the curriculum. Completing Kit II means a student will have begun the study of algebra. We also offer Montessori flashcards and Montessori beginner base 10 workbooks. New products are continuously being rolled out at shillermath.com. We also publish a monthly math tidbit with interesting math biographies, SAT tips, math humor, and a puzzler, which is available free by registering on the web site. What is unique about ShillerMath? ShillerMath truly forges new ground in homeschool math education. Regardless of age new students can easily enter the program with the prescriptive diagnostic tests and lesson plans (both available free from shillermath.com). Students use 100% of their brain with the kinesthetic and auditory components typically lacking in other curricula. No lesson preparation requirement for the parent makes ShillerMath use easy. The inclusion of all learning styles makes it fun. And the Montessori basis makes it effective. It's why thousands of homeschool families tell us we've changed their lives. What advice do you have for home educators? Leverage the opportunities you have as home educators. Don't feel that you have to provide your children the same education they would have gotten in a public school. Don't make life difficult and overwhelming by choosing curricula that require lots of preparation. Do find curricula that let your children use every part of their brain. Seize every opportunity for your children to grow at their own pace and to make developmentally appropriate choices. And always remember that your work as a home educator makes the world a better place. For more information about ShillerMath, please visit its website, www.shillermath.com. Here's some additional information about Montessori homeschooling. 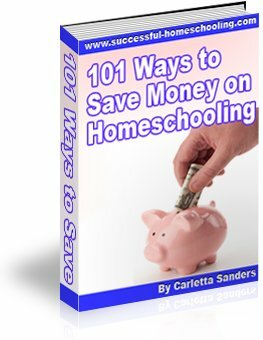 101 Ways to Save Money on Homeschooling! Enter your name and e-mail address below to receive a FREE copy of 101 Ways to Save Money on Homeschooling! You'll also join over 5,000 homeschoolers in receiving our free, monthly newsletter full of tips and ideas for Successful Homeschooling.